I managed to come away from last weeks show with this old shooter. 5 1/2" full blue, (refinished) from 1900. Has a bright side hammer too but the lockup is unbelievable. Front base pin hole is bushed too so whoever worked this old COLT FRONTIER SIX SHOOTER over really knew what he was doing as far as making a shooter. Killed most of the collector value but hey, I like it. Shoots good too. I perforated my burn barrel with it. COLT FRONTIER SIIX SHOOTER is all the caliber ID Colt put on the 44-40. And the coolest Colt ever. I can't believe they don't make and mark them as such today as a standard model. Congrats ! That's a barn-burner of a find, for sure. Dang Ron that`s a beauty. Thanks Lenn, I have too many of them but this one just called out to me. That gun looks like another example of "someone who was bored on a Sunday afternoon". By that I mean it looks "clean" and not all pitted/beat up. The grips are honestly worn with no dents, cracks, etc and I'm sure the rest of the gun was the same way....used and not abused. The gun is so tight and in time that and the lettering is still so crisp I'm thinking about re-casing the frame and hammer and just keeping the blue. Inside of bbl and chambers look new and it shoots to point of aim with my ffg loads. If I just put it in my holster and drag it around with me I'll not live long enough to wear it down to how it should look. Wish I could just go shoot a match with it. Do you have a recipe for unbluing the frame? I actually have a couple of SAAs that are full blue. 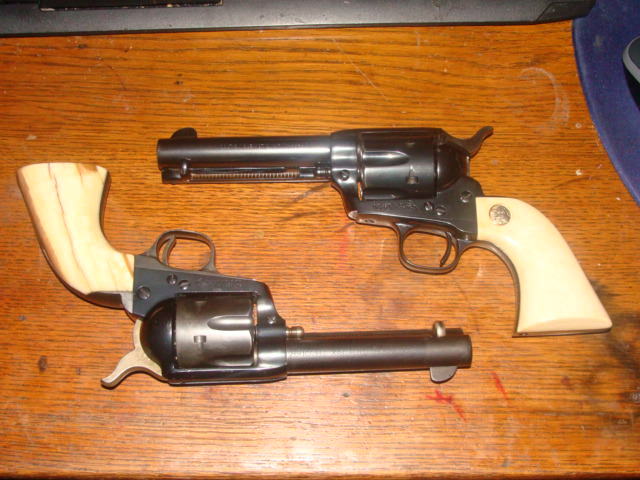 One from the custom shop with ivory and the other a commemorative that I made into a match gun with ivory. Maybe I should put ivories on it?